It’s been glorious the past few weeks. The warmth of the sun, long mild days, gorgeous light, clear blue skies and sultry evenings - all the ingredients that make a sweet summer’s day. Summer for me usually chimes in with the ringing of the bell at Soeren’s school. His excitement of having the next 6 weeks off is so contagious that it marks the begin of an entire season for me. I beamed from ear to ear because in his simple words lay all the emotions I too felt with him. Spooning the ice cream I moved closer to him and told him the story of my best season of the year. Not much older than Soeren, I too was always eager for summer break to begin. Living in Doha one could only leave the heatwave and head towards cooler parts of the world. For us we would either head to Europe for a few weeks, followed by a longer stay in the US with the various aunts, uncles and the grandparents or when my grandparents were spending the summer in India we would fly in the other direction to spend time with them in their Delhi house. I loved the times we spent in that house. I would often wake up just before dawn just to be able to accompany my nana - grandfather, to the milk depot where we would buy canisters of fresh milk for the day. We delivered the milk to the kitchen, where my nani - grandmother would be preparing breakfast for the house full of family. The best part of the whole summer however was the first day. After we had delivered the milk in the kitchen, nani’s wink would always send waves of excitement through me. I would count the long hours of the morning and the longer hours of the afternoon, impatiently waiting for my nani to make her much awaited appearance. Her footsteps would betray her as she came out on the veranda where my cousins, brother and I would often be playing games, in her hands she balanced a tray with several bowls of creamy, vivid yellow saffron and mango kulfi. 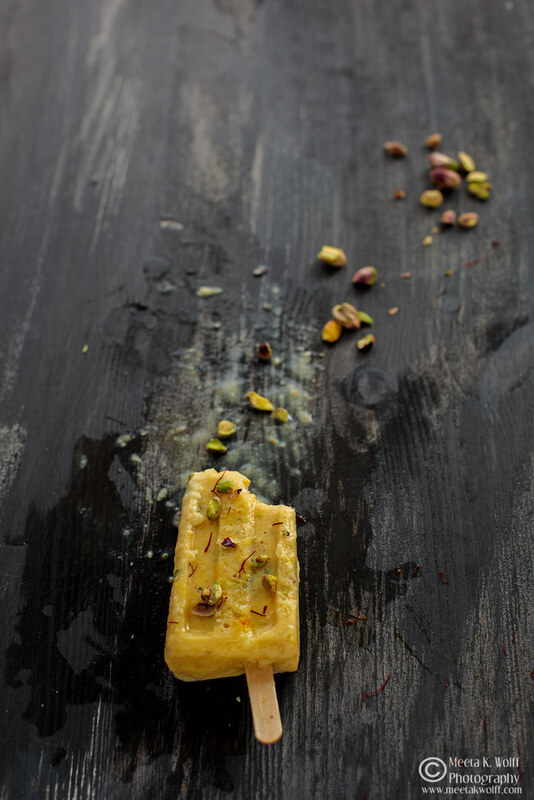 It was not just any kulfi, it was the kulfi that marked the start of our summer break. Scoops of icy kulfi flavored with sublime saffron and sweet mangoes, topped with falooda (vermicelli noodles) perfumed with rose water. 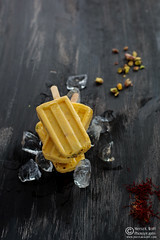 That very first bowl of kulfi for me held all the upcoming enthralling experiences that would make a memorable summer. “That was my favorite part!” I told Soeren “The saffron mango kulfi to kick off summer break - the best season of the year” I winked at him. That weekend I had an idea. Together with Soeren we created a treat with a twist. Something that captured the essence of my memories and his sentiments of summer break. Dissolve the cornflour in about 1 tablespoon of almond milk to make a thick paste. Set aside. In a saucepan, heat the remaining almond milk, evaporated milk, cardamom pods and the saffron making sure not to boil. Add the sugar and stir to dissolve. Add the cornflour paste to the milk and spice mixture and stir until the paste has dissolved. Cook on a low flame until the mixture has thickened. Set aside to cool. Put the frozen mango cubes in a blender and puree finely. Add the puree and the pistachio nuts to the milk and spice mixture and mix well. Pour the kulfi mixture in popsicle moulds, place the lids on the molds and add sticks through the holes. Optionally, you can wait until semi frozen before you put sticks in. Freeze kulfi popsicles for 8 to 10 hours, preferably overnight. Serve cold as is or sprinkled with more chopped pistachios. 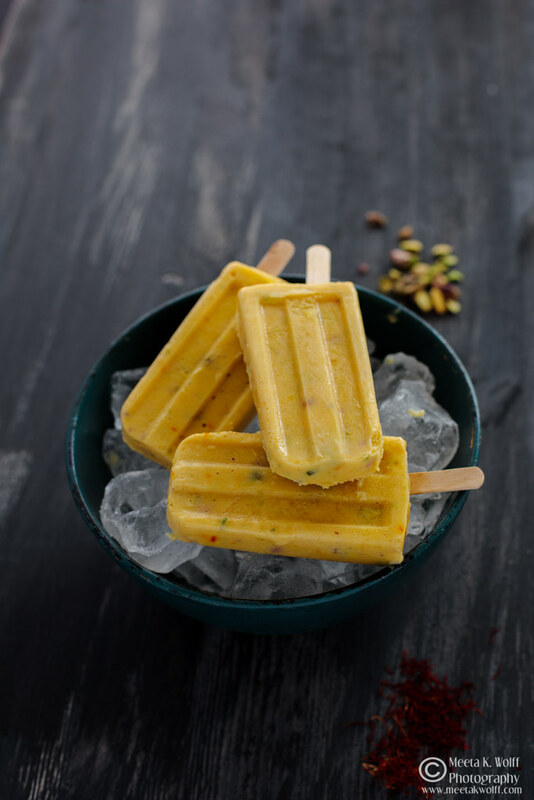 I made the kulfi popsicles with almond milk to boost the flavor, cardamom pairs perfectly with the saffron while the ripe mangoes impart their sweetness. I was reminded of that same anticipation I had all those years ago, as I walked out on our terrace holding up two of the popsicles in my hands. Sitting on our stone wall this was a new memory in the making. Do you have summer rituals that you enjoy? I hope you are enjoying your summer as much as I am. The best part is that we have a long way to go before it ends. Enjoy each moment! 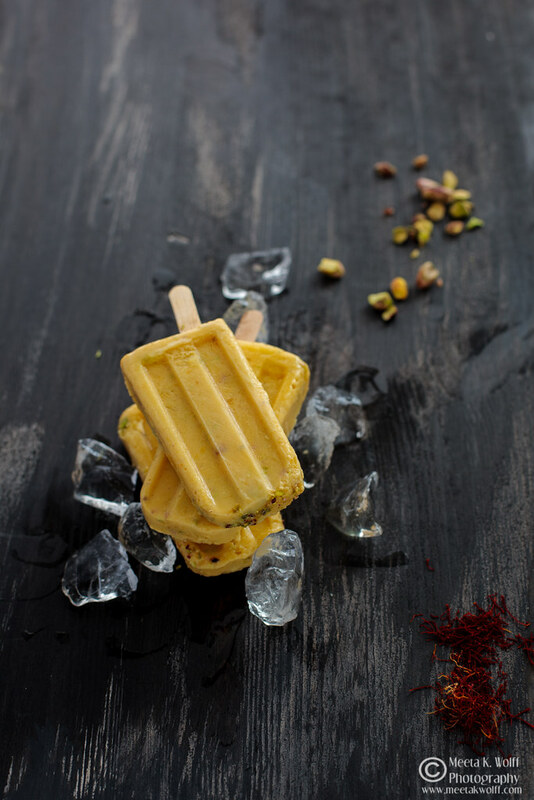 I rarely crave ice cream, but I would gladly taste your kulfi popsicles as they sound really interesting. An original flavor! Enjoy the heat and stay cool! I think you would like this Rosa. Hope you are enjoying the summer too. LOL! Yes those times were special. Shame that my grandparents have passed away ... they would have shown Soeren so much through their eyes. It was a great treat and included my favourite flavours. Thanks for the comment! Thanks Simi! Glad you like the style and the flavours! I've been craving home-made mango ice cream.....my dad's uncle used to make it for us when we were kids.....I can never forget that flavor.....that love. memories are priceless! The are indeed. I love how food always brings out the best memories. Thanks for the comment! Such an elegant flavor combo for pops! Do not remind me of the turning seasons soon! But these pops can be made any time! HA! Yes it's time we meet again. Miss you! Have a wonderful summer - let's hope this weather stays glorious. So far so good! Look forward to seeing you soon! I love that you took such an Indian treat and blended it with a shape so American! As a Floridian, ice cream was part of our summer like days at the swimming pool or running through the hose spray or ice cold watermelon. I love rituals like these - and yours with Soeren are wonderful and memorable. Fusing the experiences of 2 places that influenced me and my life - only you noticed this! I remember summers in Florida too and those are my exact same memories too. those kulfi pops look awesome... a few weeks ago I tried making kulfi but I boiled the milk too much and I ended up with more of a rabri - the kulfi is still sitting in its molds in my freezer.. no takers for it. What I love more is you used almond milk - I have a pack sitting in the fridge and I've been scratching my head as to what to make. My 2 year old loves icecream and I wanted to make him kulfi too (hence the previous attempt). Thanks for the perfect recipe - I'm going to make this!! Do you think I could use fresh mango btw? I have a few of those sitting too and would prefer using fresh ones. Archana ... yes I used fresh mango and froze them. I find it works better than adding fresh mangos straight into the blender. Let me know how it goes! These sounds wonderful! I purchased saffron for the first time ever yesterday with no real plan. Now I know how I will use it! Hope my ground cardamom will work. Love this one. I have been making avocado popsicles. Just great. I will try this as I'm such a sucker for cardamom. Great recipe. Would never have thought of this one. Will make these for the kids for sure. Just made some peach ones last week which was nice. Thanks for a cool idea!